The Roaster Machine is fabricated in U shaped sturdy container body, having top cover, centrally located bottom discharge valve and longitudinal ventral shaft on which Spiral ribbons are mounted. Our specially designed spiral ribbons gives the best roasting / blending results due to three dimensional actions. Thus every particle comes equally in contact with the heating zone and being get roasted equally. The Roaster Machine are available with options as per customer requirements, having Full Stainless Steel construction, OR with contact parts in Stainless Steel and Non contact parts in Mild Steel with Enamel / Epoxy paint. 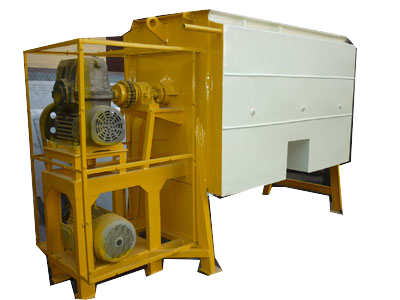 In conventional type Roaster Machine the heating is achieved through the Jacket filled with special purpose heating oil which is heated through Electrically operated oil immersed heaters. The heating temperature is controlled through digital temperature controller which can be achieved up to 2500 C.
The production with conventional electrically heated Roaster Machine has been affected due to recent power crises, the cost of the generator power with high electrical load is defiantly not affordable. Considering these problems we had recently developed the Roaster Machine with LPG (Gas) heating arrangements. Addition to the gas heating the heating can also be achieved with hot oil circulation through thermo pack boilers, using agro waste, wood, coal, or diesel fire. It has all that advantages which electrically operated Roaster Machine has, such as Auto electronic operation, ignition, temperature controlling system etc. The heating temperature can be achieved easily in very short time up to 3000C. using hot air circulated through specially designed heating jacket. Blender - Keeping the heating system off the machine can be used as blender for blending / mixing any type of powders, granules type products. Cooling Blender – The roasted products can be cooled to 35 to 40 Deg. C by using cooled water generated through cooling tower and circulating through cooling jacket. Specially for inline product systems, such as ready to cook items (Upma, Dhokla, & Gulabjamun pre-mix), chilly powders etc.